Monica, what was your background before yoga? I found yoga, or better yoga found me, sixteen years ago in 1999. I was already thirty-eight years old by then, was living in an international community in South India called Auroville and felt like I had already had more than one life. My life did not definitely evolve in a linear or smooth unfolding of progressive events predictably leading one to the next, but had rather often taken sudden turns or unfolded on dirt tracks. I never lost my sense of direction, but oftentimes felt the challenges were big enough to scare me. I was born in Milan, Italy from a very loving mother and a rather uncaring father. I don’t have many memories from that period if only flashes of some domestic violence. When my mom finally managed to leave my father to move back into her family, my brother and I found a new father in my uncle, and we had a grandmother, too! My uncle was unique in his way of caring for the three of us. Childhood was then happy and easy until the death of my already very sick grandmother, followed one month later by the sudden death of my uncle in a motorcycle accident. From then on, I remember things started to get difficult, plus I was turning fourteen. This was to be the beginning of a next chapter, and the end of my dance career: I found a job as a designer with an architectural firm, one job lent to another and that went on for a good part of my twenties. Life in the city was full but tiring. Parties and late nights were not reserved for the week-ends but energy reserves were still high for sometime. The break up with my then partner was instrumental for the next change of direction. We were meant to go on holiday to Jamaica together but the sudden break-up made me change direction. I went east instead, in the opposite direction, and that was the beginning of a life long relationship with that part of the world. Back from a three months stay in Sri Lanka and an unexpected stay in a local theravada monastery, I searched for a place in Italy where I could continue to study what would become an integral part of my life and my first experience of a formal practice for the next eight years, vipassana meditation. 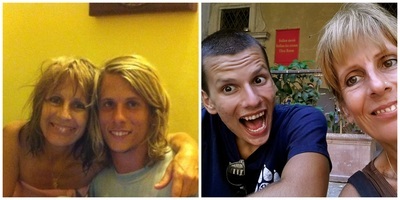 I found it in the name of John Coleman and the International Vipassana Center that was hosting his retreats in Italy. John was an anarchist in the otherwise very strict landscape of vipassana. Having been one of the first students of U Bha Kin in Burma in the 50s, he had kept a very low profile unlike his friends Goenka, Sayama and U Chit Tin. I found in him my mentor and first formal sadhana teacher. In the years to follow I became more and more involved with the retreat center activities and its satellite branch in the city, and lived long periods there, assisting and acting as his interpreter during several retreats. I was also holding the weekly meditation sessions in the city, and one day unexpectedly I got news that John had made me and other two of us teachers. Zoom back to my return from Sri Lanka a few years earlier. As my connection with vipassana deepened, so had my love story with India. Sri Lanka had been the easy stepping point for a broader landscape that would call me back year after year for a few months at the time starting from 1986. The love story with India culminated in 1994 with a bachelor’s degree in Anglo Indian Literature. I had by then left my job as a designer and had worked for a few years as a temporary teacher of English and French in primary, middle and high schools in Milan. I had been a literary translator for a couple of years and had also finished a three years undergraduate course of studies in Hindi. At the time John wanted me to become a teacher, I had also just met the father of my future kids and was writing my dissertation. Life was full enough. Sanjay, my first son was born two months before my graduation, and ten months later I was with him and his father on a plane to India. We rented out my small flat in the city and lived off that rent for sometime in India. My kid’s father was studying ayurveda, and I was just ready to be a full time mama. I had studied and worked hard for several years, and at thirty-three I felt like a new chapter was about to start. A few months after our arrival we got to know about Auroville, the international sustainable and intentional community in Tamil Nadu where I later built my life and settled for the next twenty years. We moved there for one year but then had to go back to Milan due to some problems with my flat. We ended up staying in the city again for a couple of years. Satya, our second son, was born there two and a half years after Sanjay, and when he was almost two, I packed up my things and went back to live in Auroville with the kids, and for good. My relationship with their father was coming to an end, and a new unfolding was about to take place. Auroville has stayed for twenty years now. A long chapter... A living laboratory for human evolution. There I raised my kids, and they are now young men who just left the nest in search of adventures. There I met ashtanga yoga and the partner with whom I deeply shared and taught for six years. I there built my house and shala. I there created a beautiful little oasis of peace. Much of yoga is about finding stillness in transition and flux. Nothing remains constant. 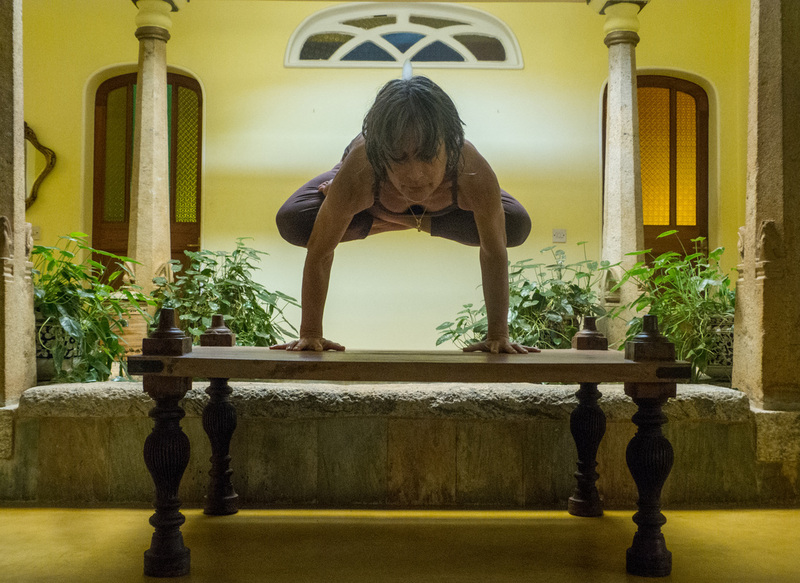 How has the practice helped you remain centered? I wish I could say I have found a stable center in life. I’m still working on it. I spent many years trying to already be in that center rather than accepting to be in the process of finding it (and losing it, and finding it, and losing it…). I have always had the tendency not to feel comfortable in the in-between spaces, impatient with the process of finding perfection and being in general demanding with myself (and others as a reflection). Admittedly, this comes in handy when it is about working with students, having high expectations and standards, challenging them to get the best out of their practice (and life - as a reflection - if we consider any formal practice as a tool, and the approach to it as a microcosm of the bigger macrocosm that is life). However, when it comes to be with the reality of the world, which by definition is not a perfect place, then my challenges would start. I have been very impatient with the ways of the world, sometimes at the point of feeling I don’t belong there. I had moments in my life when I felt strongly pulled towards choosing the ascetic life, withdrawing from an imperfect and backward world in an attempt to find peace, stillness and freedom. I believe having had children – among other things - has helped me tremendously in developing an acceptance of the process of finding stillness, or remain centered, and staying with reality. After all, they are your own flesh and blood, and if anyone were to be blamed for their inadequacies (especially when they start growing up and pass through the testing years of adolescence), that one person would be just you as a parent. Honestly, sometimes I feel resilience is something that I have developed more than balance so far. This as a result of the renewed commitment to a demanding practice (passing through the daily fire of putting oneself in a challenging situation/asana), high expectations as a teacher, life circumstances (most of all having been a single parent of two boys now young men for many years), building a life/house/shala (metaphorically and practically) far removed and in a challenging environment like India, having had my kids’ father as the cross of my life for many years in his utmost disregard of any basic understanding of the implications of being a parent, and so on and so forth, obviously not unlike many others. Having come from many years of vipassana meditation as a formal practice, my most natural approach to the ashtanga yoga path was initially and quite naturally one of observing whatever would come into the field of awareness, whether pleasant or unpleasant, in a spirit of engaged detachment and witnessing attitude rather than an interfering and judging one. This I think has helped me to stay with this practice through all of its phases, not unlike any other valuable relationship. The initial falling in love and elation, the following ups and down, the doubts, the temptation of letting go, the recommitting and so on. After all, be it your formal practice, a friend, a partner, a parent, a difficult person or any other life situation, anything can become a sadhana and a tool for awareness. In ashtanga yoga we voluntarily put ourselves in challenging situations in the form of asanas everyday, and go through that fire aided by the flow of the breath and the harnessing of internal locks and drishtis in a process of gradually moving in from gross outer layers toward finer inner realms. As Guruji used to say, the first four limbs (yama, nyama, asana, pranayama) are hard - and the ones that need our active intervention; the following four (pratyahara, dharana, dhyana, samadhi) are easier and follow as a natural evolution of the first four. All that needs to be done is in fact pretty simple: a daily commitment of coming back to one’s mat, recommitting to the work, and see where that leads you. I also find the days when I expect less are often the most rewarding ones. Magic happens in unexpected ways most of the times. Just honestly putting in the work with the least expectations and let it all happen. That, in fact is what is called karma yoga, where the fruits of one’s work are eventually enjoyed as a natural result of having honestly put in the necessary daily work. At one point one probably won’t need a formal practice anymore. One day a few years ago I asked a friend and senior ashtanga yoga teacher whether the simple act of being with whatever presents itself to you in life and enters your field of awareness wasn’t enough, and his answer was: it would be stupid to keep using the boat or carrying it on your shoulders once it has served the purpose of taking you to the other side of the river, but until then….you better use one. And I would add: and be thankful and forever grateful you found such a sacred one, too! What have you noticed in long term practitioners of this practice, yourself included, compared to those with just a handful of practice years? As with everything where experience is key, the longer you stay with something you have committed to, the more you gain confidence based on that experience and the more familiarity you develop around it; the more you have experienced its ups and downs and plateaux, the better you are able to stay consistently with it. The first few years most newer students’ challenges have to do with discipline and maintaining their motivation alive past the initial “falling in love”. It’s common to let go and pick up one’s practice a few times in the beginning, but once that has happened a few times (be it because of lack of inspiration, life circumstances or newer fresh experiences taking over, injuries and so on), there is usually a certain solidity that slowly, slowly builds up. It comes from the experience of having seen where that leads, and realizing that maybe, in spite of what this practice demands, what it gives in return is worth it. Doubts will always resurface from time to time, as it should be. Ultimately, it’s not about coming to a point where everything makes sense, where there are no doubts anymore and where things finally fall into place beyond duality, but rather about developing the tools that enable us to face duality and navigate life’s waters without being submerged. And possibly - beyond surviving - flourish, too. The process of being able to harness the power of this practice and use it as a tool to deal with life’s immediate and material circumstances is one of the many benefits we get from years of dedicated practice. There is - as we know and as I strongly believe - more to this practice than the ability to cope with life’s challenges and finding one’s purpose and unique gifts to contribute to this world, but that may take even longer to realize: one’s life, several lives. No rush. What it gives me NOW is what counts to me, how it enables me to stay present to reality NOW. How it will evolve in the future, who knows? I still in many ways feel a beginner after sixteen years of practice, so I guess it’s all relative. The fact that I still discover something new every time I get on my mat and practice the same routines day in and day out gives me faith and reinforces my commitment, in spite of the few times I lost my practice due to injuries and rehabilitation. I learned my lessons the hard way, and I guess that adds up to experience, too. As the years passed I softened. And surrendered. I have learned to be happy with my practice even when it’s just about maintaining without losing what I had built up. It continues to nourish and support me in whatever shape it takes, but I still try at the best of my ability every day! At fifty-four, I am now asking myself questions that were not familiar to me before. I haven’t noticed major changes in my practice yet, but it definitely takes more energy for me to do what I used to do just a few years ago with less effort. It’s a lot about managing energy now and keep the practice sustainable on the long term. After all, I still want to be able to practice as long as it will be given to me to do so. How do you guide your students to use yoga practice as a tool in a manner that is helpful to their temperament and life circumstances? What are the markers? I have a hard time believing there can be fixed markers. See, when it comes to teaching or guiding students - or as I would prefer to say, supporting them in their own individual and unique journey - most of the job is based on intuition. You might have all of your nice suggestions and instructions lined up and ready to be delivered, only to discover that in that particular moment and with that particular student, they do not apply. Even if that student fits into that same recognizable category: sick, injured, pregnant, young, old, driven, lazy, etc. This is why I find the ashtanga yoga traditional system of learning and teaching so effective: intuition based on experience based on receptivity and trust from the side of the student. And years spent with your teacher, who teaches in the same way, who learned from his teacher who taught in the same way and so on: Parampara. Every student is unique and deserves to be taught in a different way, and this is possible only in a system where the instruction is delivered individually, although in the same class setting. Obviously, we all have our own unique ways of delivering the teaching, but the same frame we stay with makes sure the fundamental teaching remains undiluted. There is a lot of freedom that can be discovered in discipline and when we stay in a certain frame. The frame gives as the canvas to paint our own individual journey, but the canvas needs to be there for the artist to paint on. This holds true for learning, as well as teaching. Teaching students over longer periods of time is of help when tuning into their own needs, temperament and life circumstances. The longer the connection with the student, the better the teacher is in a position to help and support. It is true that in the end all that counts is being able to hold that space for them to reconnect with their own inner self everyday, and that alone is their ultimate guide; but let’s say most of the times knowing their “life story”, or life circumstances goes a long way when it comes to help. As a teacher, I have realized that the way I teach everyday is directly linked to my ability to keep my practice alive and growing. There is such a strong connection between what I get through my practice and what I am able to deliver individually to each student every day. The deeper I can go into my practice, the more I am able to tune into each student effectively. Nowadays I tend to teach in my own shala in Auroville for at least half of the year, the good Indian winter season when I receive most of my students, while the rest of the year I travel and teach at different locations. This means I do not get to work with the same students for more than a few months at the time, or when I travel for not longer than one month most of the times. Some come back to Auroville every winter and keep studying with me year after year, and I do have a few local students from the community, too. However long the time I stay with them, I always try to work in a way that is suitable to that particular moment in their lives, and for that much time they spend with me. I encourage them to keep challenging themselves with intelligence, getting beyond their perceived limitations but in a way that is not only will-based. When too driven, some help in the opposite direction is usually helpful. Softening and slowing down can often take them to places where will cannot. It’s all a matter of being able to intuitively “read” and encourage them to learn how to balance up their opposing tendencies, again and again, day after day with whatever they come up to practice with in that particular moment. To help them accessing the practice as a tool to smoothen up their sharp corners and - eventually - start trusting their own inner guide to practice in a way that is balanced and nourishing beyond perceived or unperceived expectations. To support them in times of discouragement and disillusionment, when the practice does not seem to work, or to be able to appreciate their progress when needed. This last point is also part of my personal work: I have by nature - both with myself and with students - a sharp and critical eye that can catch details quite easily. When it comes to teaching I think this is quite an advantage, and usually appreciated by students, but the risk for me is to forget how to be able to express appreciation for all that is already there and beautiful in their practices. By reminding myself to stay tuned with this, I also have an opportunity to keep working on my own personal limitations. And this is where the connection becomes a two-way thing: I give at my best but I also get a lot in return. This alone is the greatest support. 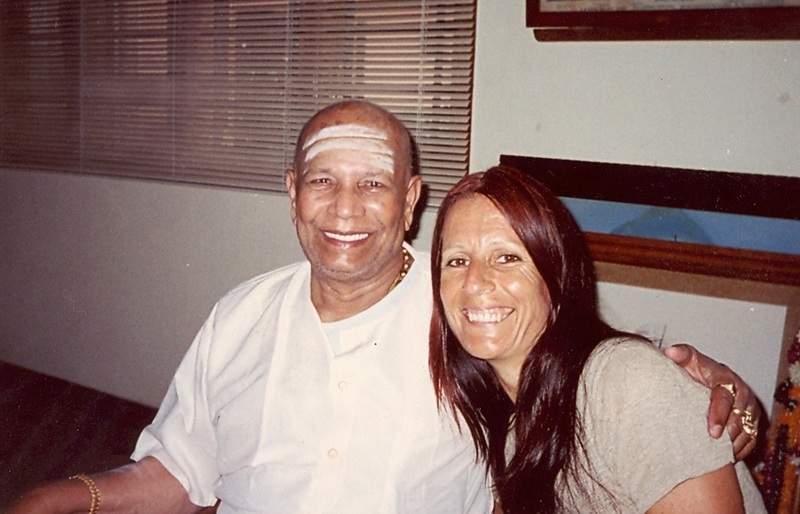 What was it like meeting and practicing with Guruji and Sharath? In spite of the love and respect I now feel for Guruji; admittedly, meeting him was not love at first sight. I had been practicing ashtanga yoga for two years before going to Mysore the first time in 2001. Karen Haberman and Gerald Disse had been my first teachers. In 1999, Karen and her ex-partner Gerald had come to live and teach in Auroville. Although many newer students might have never heard of her, she was quite famous in the 90s for being the only woman (I believe) who was studying fifth series with Guruji. 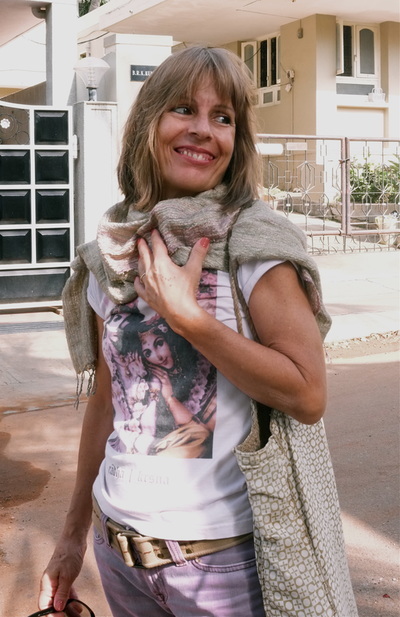 She and Gerard had spent long periods of time in Mysore but following a quarrel with Guruji in 1998, they had decided they had had enough and never went back. It was the time when a lot of rumours were circulating about Guruji’s relation with money and women. As you can imagine, I was not initially influenced in a positive way towards him as my first teachers were very critical of the whole thing by the time I started. Karen has always been very rebellious by nature, and since I knew nothing about Guruji or Mysore then, I trusted her. We had actually already become good friends even before she became my teacher thanks to the introduction through some other old time friends who at that time lived in Mysore. In 2000, I met Chad Herst through Karen (she had been his first teacher in Mill Valley), and we entered into a relationship that was to last for five years. We went to Mysore together my first time there. He had already been in Mysore a few times in the 90s, and when he offered me to go with him in 2001, I called mom from Italy who came to stay with the boys, and off we went. My first encounter with Guruji was in the old shala in Lashmipuram. He asked Chad who I was and allowed me to watch a class. I sat down there on the bench before the entrance and watched the scene: the intensity in the room, people on the stairs waiting, people prostrating in front of him and touching his feet. All of a sudden I wasn’t sure that I was ready for that. Sharath had just started offering his own classes downstairs in the living room of his house in Gokulam (where Saraswathi teaches now), and the new shala was under construction at the same time. As Chad and I were also planning to do some traveling together, we opted for classes with Sharath as he was accepting students for shorter periods, too. My first learning experience in Mysore was then with him rather than Guruji. We did not go back for three years afterwards as we had started traveling to Thailand quite regularly to study with Rolf Naujokat who had just left Goa to teach in Kho Phangan with Kirsten Berg. Following Karen and Gerald departure from Auroville, we had also started teaching there in 2003 and were in general quite busy, me with family, teaching and life in Auroville, and him mainly with finishing his master in Chinese medicine in San Diego. Plus maintaining a long distance relationship for the first two years. By the time we went back to Mysore in 2005, the shala had already opened in Gokulam and many more people were coming. From then on, it’s been a yearly pilgrimage to the source that has lasted from one to five months at the time. Chad went back to live in San Francisco in 2006, and from then on I kept teaching in Auroville alone. Guruji was then still quite active in the shala, although old and a lot of the teaching burden was already shifting to Sharath’s shoulders. As it often happens, things become more precious when gone and they become part of one’s memory. In this context, I must say my connection with Guruji has developed more in his absence than when he was still alive. At the time he was still with us, I felt there was definitely something commanding respect and had total trust in him, but the devotion and gratitude that I know feel in retrospect, I did not feel it then. Time is building this up, stronger and stronger. By the time I met him, I had already had some strong spiritual influences and guides in my life, I was living in Auroville - an intentional community with a deep spiritual direction - and I wasn’t in general even looking for a strong spiritual reference or missing any. Yoga had come to me more as an urge in the body, a re-awakening that started from the physical and went on to become a sadhana. Guruji - or what he stands for - is something that keeps growing in me as a presence and constant reference point. Through his example, devotion to the practice and teaching, and his absolute faith in his effectiveness. He and Sharath worked very hard and with total devotion, although with a different karma: Guruji had to carve it all out from nothing, while Sharath’s challenge is now how to carry on with the legacy in a completely different world scenario. I have the greatest respect for Sharath, and in many ways he has been more part of my learning process and for longer now. Admittedly, I have had my moments of discouragement and doubt, especially in the difficult years following Guruji’s passing when Sharath was facing big challenges in carrying on and defining his new role. However, and as with other aspects of my life, I am now concentrating my personal work in staying focussed on the gifts rather than the shortcomings. Sharath’s gifts are immense, and beyond description. His work is all intuitive and experience-based as a direct result of years of personal practice bearing fruits. His attempts at verbalizing his inner experience of the practice, teaching, theory or philosophy might not always be convincing to some, and there are definitely teachers who are more gifted in effectively conveying verbally. Nevertheless, and mainly because of what happens in the practice room when his teaching does not need words and is mainly passing through his hands and heart, I feel his strength is mostly to be found in silence. As we all know, words are never enough to define what by its very nature defy definition. No need. To everyone to shine forth according to his own gifts, in his own unique way. As it should be. Any final thoughts to share, Monica? I might have been lengthy enough better leave it here. Well, just one last thing: keep bringing love into your practice, teaching and life (and I am talking for myself, too!). The ability to open up one’s heart goes hand in hand with sadhana. And stay real, go with what holds true now according to your present circumstances and feels right in the depth of your heart.